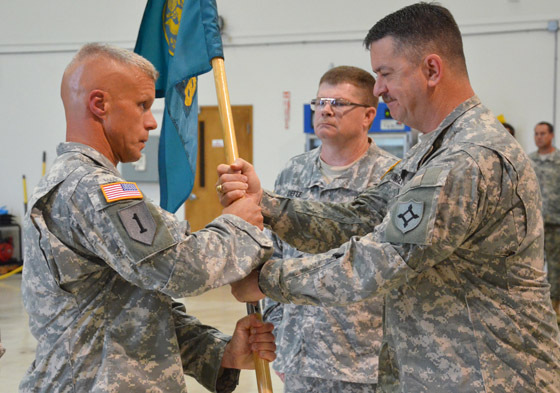 CLEARWATER, Fla. (Sept. 11, 2014) – The Florida National Guard’s 48th Civil Support Team (CST) welcomed its new commander last week, as Lt. Col. Thomas Benton assumed command of the specialized unit from Lt. Col. Joseph DeFee during a military ceremony near Tampa. 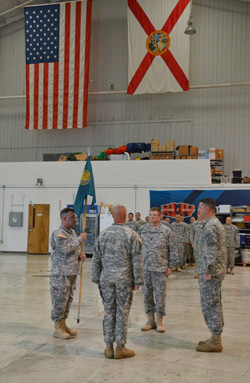 Commander of the 83rd Troop Command Col. Paul Chauncey officiated the ceremony at the 48th CST’s base at the Clearwater Guard Air Station, Sept. 5, passing the unit guidon from DeFee to Benton as a symbol of the change of command. DeFee, who has served as the 48th CST commander since the unit stood up in 1998, is currently the commander of the 44th CST – the 48th’s sister unit based at Camp Blanding Joint Training Center. After relinquishing command he thanked his fellow Soldiers and Airmen for their service during the past six years. “Your professionalism and true dedication to duty is what made my time here successful,” DeFee told the 48th members. Benton, who began his military career in 1987 with the U.S. Navy, previously served in the New York Army National Guard as the commander of the 2nd Civil Support Team. After serving in the Navy as an engineering laboratory technician, scuba diver, and later an instructor at the Naval Nuclear Power Training Unit, Benton joined the New York Army National Guard in 1995 as a field medic. He received his commissioned 1997 and served as an infantry platoon leader. In the domestic response field he served as: a survey team leader and operations officer; a plans and operations officer for a Domestic Operations Directorate; and deputy commander and later commander of the 2nd CST. As one of the initial members of the National Guard’s civil support team program, Benton was called to duty with the 2nd CST during the catastrophic terrorist attacks of Sept. 11, 2001, in New York City. There he joined other military and civilian personnel in assisting in the chaotic early days of the “Ground Zero” response effort. Benton explained that this was his first real weapons of mass destruction mission with a CST. “I was a young lieutenant and responded to the World Trade Center on 9-11, and one of my last responses in New York was to Superstorm Sandy…another big disaster,” he said. Benton also served one tour in Afghanistan in 2008 in support of Operation Enduring Freedom as a commander of an Infantry Embedded Training Team. He has a Bachelor of Science Degree in Nuclear Technology from New York Excelsior College, a Masters Degree in Fire Service and Emergency Management from American Military University, and is a graduate of The Command and General Staff College.